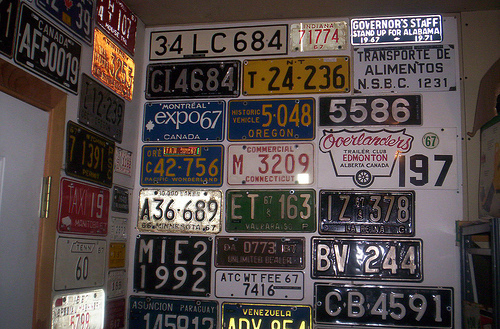 Transportation Costs > How Much Does a License Plate Cost? How Much Does a License Plate Cost? Part of owning a vehicle is the paying for the registration. Each car on the road must be registered with the Department of Motor Vehicles, better known as the DMV. This registration will link your car to you through your license plate. All a police officer would have to do is look at your license plate or your car’s VIN (vehicle identification number) to find out who owns the vehicle. All registrations can be done through your local Secretary of State’s office. The first time you register your car, whether it is a new car or used car, the price will be higher. The price of registration will vary depending on your state, the vehicle type, vehicle price, registration period and type of license plate you want. Some states will have a flat fee while other states will charge you based on your car’s value. People who live in Minnesota may pay as little as $4.50 while citizens of Vermont may pay up to $212+. For a complete list of state-by-state fees, visit DMVAnswers.com. Refer to the chart below for the average cost in your state. Each state will have its own formula, and to give you a better idea, refer to the table below to see what you may pay in the state you reside in. Once you have obtained a license plate, you will need to renew the plate annually. Each year you will need to purchase new license plate tabs, a sticker that proves you have registered for the current year. Without these tabs, police officers can ticket you. The price of this is very similar to the cost of initial registration; however, many times it is cheaper since the fees and taxes for renewals are lower in most states. $8 + assessed value of 60% of MSRP (this is reduced by 16.25% each year) every one or two years. The first time you register, you will receive a paper registration (which you should always keep in your glove box) as well as the actual license plate. Depending on the state, some allow you to register for years at a time. With each renewal, you will receive a new paper registration with the current year, as well as a new sticker you place on your license plate. This renewal can often be done online, in person or by mail. This will depend on the state. States will commonly send you a reminder 30 to 60 days prior to your license plate expiring. If you license plate or tab is lost or stolen, there will usually be replacement fees. If you would like to purchase a personalized license plate, the fees can be $5-$50 extra. These will also take much longer to receive, so planning ahead is important. Specialty or customized plates will be an additional cost. For example, in Arizona, you can choose from various designs such as an American flag, clouds, PBS or the Arizona Cardinals football team. Some states may require additional testing such as a smog test. You may need this test done in order to get your license plate.